In Dark Green Religion I mentioned how Drift and Surfing magazines drew on my analysis of surfing as a form of aquatic nature religion. In August 2007, based on a draft of a paper I put online for comment, Howard Stanwick featured my analysis of Surfing as Aquatic Nature Religion. As I wrote in Dark Green Religion, his rationale for this feature further exemplifies dark green spirituality (see his afterword on p. 148 of the magazine). A few years later, Swanwick turned this feature into a slideshow, along with other featured articles, some of which also exemplify surfing spirituality. See "The Aquatic Nature Religion" feature on the right column of this features page. 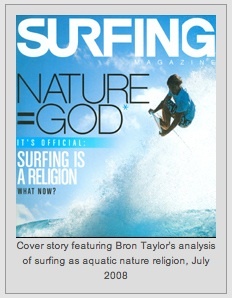 After my article on Surfing Spirituality was published in the Journal of the American Academy of Religion (December 2007), Surfing Magazine also featured the idea in its July 2008 issue, the cover of which is shown above. It repeated surfing legend Tom Blake's words, which I had quoted in my article, Nature = God. The article included interviews with many surfers who understand their practice as spiritual. By Bernie Baker, Surfer Magazing, 27 April 2010. Jim Rawlinson was surfing in Hawai'i when suddenly a Tiger Shark chomped down on the back of his board, pulling it underwater, lifting the front of his board into the air, causing him to slip down the board right onto the back of the shark. At this point, Rawlinson reported, "I was about two feet back from his nose. I think he was about two feet wide from how my legs were spread across him, like a horse. You know, I couldn’t see his eyes because I was on top, but I felt like there was some connection here and it was real peaceful." He added later, in a way reminiscent of others described in Dark Green Religion who have encountered great predators, that as a result of this experience, he felt "humbled and blessed." Additional resources follow that illustrate the ways in which some surfers understand their practice as a form of nature religion. The Way of the Ocean (December 2010) is a new surfing film that from the promotional material I surmise will express dark green spiritual sentiments. Alice DiMicelle provides a great example of aquatic nature spirituality in a music video featuring kayak surfing. The Evolution of Surfing by Ross Cummings, which I discovered by searching for “surfing spirituality” on youtube, is one video example of those who consider surfing a form of nature spirituality that promotes environmental concern. Surfing music. Its not all about soul surfing but some of it is. 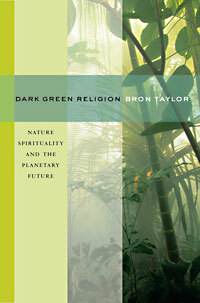 Surfing Spirituality, from a presentation that corresponds to chapter 5 of Dark Green Religion. Surfing Heritage Foundation, 'Building a Community of people who share a common passion for the Spirit, Soul and Culture of Surfing." The foundation is engaged in recording oral histories and otherwise archiving the historical development of surfing culture, globally, and has plans for a major museum to house its growing collection. Photographs will soon be posted from my August 2010 visit. Surfers Journal. Steve Perzman, the founding publisher of Surfers Journal, in reflecting on its history, wrote that it was developed with "experienced, intelligent surfers" in mind. He then added, "despite all the philosophic and poetic waxing about man and wave, the connection to nature, and the quasi-religious experience of the ride," those producing it don't take themselves too seriously. I had the opportunity to speak with Perzman in August 2010 in San Clemente, California, which reinforced my impression that he and the journal he founded is a good example of dark green spirituality. Wave Dancers Surf Tribe expresses many themes common to dark green religion, including a critique of "totalitarian agriculture" (drawing on Daniel Quinn), a stress on the need to evolve culturally and spirituality, a vision "to live the simplest life that allows for greatest happiness. We will daily be focused on food, shelter, clothing, and surf. As a nomadic tribe of surfers, we shall embrace all that is aquatic and support one another in our daily lives. Living on sailboats will be our connection with the ocean, becoming expert watermen in wind, waves, and tides. . . . We will strive at all times to have a positive impact on the environment and become stewards of the ocean and lands that sustain us. We only take what we need on a daily basis and do not waste any of our natural resources. We chose to be our own individual messiah. We wish to live in peace and once again embrace all of nature that exists in and around us." As noted in Dark Green Religion, this site provides another example of surfers expressing appreciation for Timothy Leary's positive evaluation of surfing spirituality. Those responsible for this also expressed affinity with it called Huna, the ancient shamanism of Hawai'i, providing wave-dancer links to information about Huna, environmental organizations, and Daniel Quinn's Ishmael Community, as well as some of my own articles exploring surfing as aquatic nature religion. Many of the other links at this website illuminate soul surfing. Par. 4, Soul surfing: My focus in this chapter was not on those who find in surfing religious lessons that reinforce longstanding religions, although these are worth study; For Christian surfing associations see www.christiansurfers.net andwww.christiansurfmag.com. The story of a teenaged girl who lost an arm to a shark, which describes how this tragedy increased her faith in Christ, is representative of the idea that surfing provides religion-reinforcing lessons; see Bethany Hamilton, Sheryl Berk, and Rick Bundschuh, Soul Surfer: A True Story of Faith, Family, and Fighting to Get Back on the Board (MTV, 2004). Jewish surfing spirituality is found in the writings of the “surfing Rabbi” who has written about the religious value of surfing and how it reinforces his belief in God; see Nachum Shifren, Surfing Rabbi: A Kabbalistic Quest for Soul (Los Angeles: Heaven Ink Publishing, 2001). Par. 2, TinCanFury (the final surfer quoted in this paragraph), in a way typical of self-conscious soul surfers, contrasted soul surfers with those who do not appreciate its spiritual dimensions, adding that soul surfing “Does not include the following: surfing for money, making fun of groms [inexperienced surfers], spending more money on equipment (board, suit, etc.) than most people spend on food in a year.” This and other soul-surfing related writings are at http://everything2.com/index.pl?node_id=717980. The website of the Hawaiian Boarding Company demonstrates that surfboard making, understood as a spiritual practice in which the life force in the tree used for the board must be respected, has survived into the 21st Century. The site explained, “Pohaku [the native craftsman] must choose the right log or wood for the surf board he is going to carve. Once the right wood is found, there is the offering of the ho'okupu (ritual sacrifice) to the gods and ancestors to ask permission to take the wood. This is our native way of assuring the gods that the life of the wood will continue, just in another form. This protocol is the honoring of the gods and our ancestors for the knowledge of the old ways. Once the wood has been blessed, he then rough cuts the log into the general length and width of the surfboard type he is building. The next step is the offering of the ‘awa (kava) to invoke the awakening of the spirit that resides in the wood, in this way Pohaku connects with that spirit and sees the image that will be created from the wood and the name that will be given to that work of art. He is then able to measure by eye and outline the surfboard that lies within the wood. Now the labor-intensive stage of carving the outline of the board begins. It is vital for Pohaku to follow the lines of the shape he has seen, while maintaining the integrity of the natural flow of the wood.” The more mundane aspects of the building process was then described in detail. The narrative continued that, after the board is finished, “the final ho'okupu offering is made to recognize the new life of the wood, assuring the gods that the original life of the wood is continuing in this new form.” See http://www.hawaiibc.com/surf.htm (quotes found there February 2006). Par 4., wave calling rituals and surfboard sacrifices were playfully performed at surfing-themed parties, but play can become profound ritual, and for some surfers, it became precisely that. Robert Orsi asserts that playfulness can play a dramatic role in transforming individuals and social realities Robert Orsi, "Everyday Miracles; the Study of Lived Religion," in Lived Religion in America, ed. David D. Hall (Princeton University Press, 1997), 10, 13. For another example of how play can become invested with religious meaning, see Christopher Manes, "On Becoming Homo Ludens," Earth First! 9, no. 1 (1990) and Dolores LaChapelle, "Play: Crossing the Artificial Boundary between Human and Nature," Earth First! 9, no. 3 (1989). There is more than meets the eye to the deep water swells as they march majestically across the sea, to the silent drums of the atom. Dedicated sailors of all times knew this. So do surf riders who have spent years of their lives viewing these waves at close range, as the locked in power is released upon the reefs and shores in a symphony of sound, and shapes of strange dimensions. All of this the surf rider has going for him, and he experiences a peculiar joy and inner satisfaction in putting this force to work under a board. This may be because that force is a spiritual, a divine force that has been in production by nature or God for a long time. Why say nature or God? Just this: over the years, the close association with waves of all kinds, coupled with a religious background, has convinced this old surf rider that nature is synonymous with God. So the word nature, for all practical purposes may be usefully used as an alternate to the word God, to better understand life, living, and the ocean wave, as part of the almighty and thus give due credit and respect for its mysterious hidden energy. The same formula applies to all things; each has a bit of the divine power to sustain it; be it an atom, a wave or man. Religion scholar Jonathan Z. Smith once said “Ritual is not an expression of or a response to “the Sacred”; rather, something or someone is made sacred by ritual” (Smith 1987: 105). Perhaps the creation and watching of surf movies, especially when done collaboratively, contributed to the understanding of the practice as religious. The film Five Summer Stories (1972), which in 1987 was selected by Surfer magazine as one of the three best surf movies of all time (The Endless Summer topped the list), provides a cinematic example. [Warshaw, The Encyclopedia of Surfing, 203.] It began with a stunning sequence in which the camera is enveloped in rolling surf, and an evolutionary cosmogony is invoked in which the creation is depicted as beginning in the sea. The narrator then suggests that through surfing people can “escape the confusion onshore” (presumably including the antipathy that characterizes human societies) and thereby find “peace of mind.” See also the video resources. Drawing on Australian survey research Peter Bentley and Philip J. Hughes, Australian Land the Christian Faith: Facts and Figures (Melbourne, Australia: Christian Research Association, 1998), Nancy Victorin-Vangerud demonstrated the deep connection to the sea and corresponding and sense of peace the majority of Australians derive from it; see Nancy M. Victorin-Vangerud, "The Sacred Edge: Women, Sea and Spirit," Sea Changes: the Journal of Women Scholars of Religion and Theology 1 (2001). I am grateful to Sylvie Shaw for pointing me to this work. Par. 3, Bill Devall, with the Philosopher George Sessions, produced the most influential early book promoting the deep ecology movement; see Bill Devall and George Sessions, Deep Ecology: Living as if Nature Mattered (Salt Lake City, UT: Peregrine Smith, 1985). Devall, who died 26 June 2009, was a sociology professor at California State University, Humboldt, in Northern California. He was also periodically involved with radical environmentalist campaigns there and worked with Earth First! Price too quickly followed Eliade, however, when he turned such analysis to surfing, stating that it is was “an example of the religious origin of a ritual activity that has become disconnected from its sacred context is the recreation of surfing, which originated in relation to various religious rituals and impulses among the indigenous peoples of the Pacific Islands” [Price, "Naturalistic Recreations," 428]. For some indigenous peoples the practice retained, or has assumed, a sacred character. Moreover, as is typically the case with religion, new forms have been invented or grafted into the old in religion’s typically dynamic and changing process. Par. 3, more on religious terminology in outdoor experiences: Just assurfers speak of going surfing as going to church, so have a number of fishers and hunters with whom I have spoken about going to the woods and rivers where they practice their own nature religion. Michael Lemons is an avid surfer (and anthropologist) who upon reading a draft of an early article I wrote with Glen Hening on surfing spirituality sent me an email about such terminology. He recounted how he and his best surfing friend “call surfing ‘going to church’ and invented other religious terminology, such as ‘kneeling at the pew’ (sitting on our boards), ‘watching the sermon’ (staring at ocean/waves), ‘give me a sign’ (hands raised, calling for waves). He commented, “This is our vocabulary, and as far as we are concerned, we invented it in the sense we never heard anyone else talk like that, and though it is obviously no new concept, we feel pretty original about it anyway. So it kind of sprouts from surfing itself, i.e., it’s not just a fad that spreads with the spread of surf culture. Surf ends up being a metaphor for everything, and everything else ends up a metaphor for surfing” (2 March 2005 email). I think he is correct that no one has to suggest such terminology for surfers to creatively appropriate existing religious terminology and metaphors and apply them to the practice they find most meaningful in their lives. Par. 2, on fears of surfing fundamentalism:Matt Walker, for example, has seen in surfing subcultures, and himself, “the same fundamentalism, fear and self-righteousness that turned me off to organized religion in the first place.” In this he worried about the “proof that any source of unbridled joy can easily turn into seething hatred. Even inside my own heart.” [Walker, "Science of Stoke," 130.] I have heard similar worries expressed by radical environmentalists about their spirituality. Those with such worries, however, are unlikely to become fundamentalist extremists, of course, and are more likely to resist such developments within their subcultures.